What They Say.....Molly Arnette is very good at keeping secrets. She lives in San Diego with a husband she adores, and they are trying to adopt a baby because they can't have a child on their own. But the process of adoption brings to light many questions about Molly's past and her family--the family she left behind in North Carolina twenty years before. The mother she says is dead but who is very much alive. The father she adored and whose death sent her running from the small community of Morrison's Ridge. Her own birth mother whose mysterious presence in her family raised so many issues that came to a head. The summer of twenty years ago changed everything for Molly and as the past weaves together with the present story, Molly discovers that she learned to lie in the very family that taught her about pretending. If she learns the truth about her beloved father's death, can she find peace in the present to claim the life she really wants? What I Say.....Awesome book. I read it in one day, and this was a wet book for me! Started it floating in the pool, and finished it at midnight (my normal bedtime is 9pm!) with tears pouring into my pillow. Molly is living a happy life in San Diego with her loving husband. The only thing missing from their lives is a baby to complete their family. But Molly is unable to carry a baby, so they start the adoption process. Seems like the right thing to do, but it opens up a lot of emotions for Molly. Doors and memories that she has kept tightly shut for many years. Even her own husband doesn't know the secrets she keeps about her family. I loved the way the book popped back and forth between 14 year old Molly and present day Molly. It was heart wrenching to watch adolescent Molly maneuver through the most important summer of her life, knowing what was coming. Their whole extended family and friends were all so entangled that it was easy to understand how an adolescent girl could become so confused about what reality really was. How can you learn to trust yourself when all of the adults around you are keeping secrets? Add in a fast new best friend, and a hot, older guy who wants to move faster than Molly does, and you've got all the ingredients for an difficult summer. As Molly and Aidan begin to navigate an open adoption, Molly wonders how she would really feel about having the birth mother involved in their lives, but doesn't seem to make the connection between her feelings and her past. It certainly doesn't seem to inspire any empathy for her own adoptive mother. I don't want to say any more because I hate spoilers, but I couldn't go to sleep until I knew how the story ended for Molly. I fell asleep on a wet pillow, but it was so worth it! 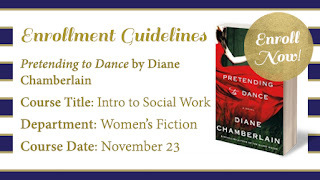 This is my new favorite Diane Chamberlain book - and believe me, it has a lot of competition! Share book reviews and ratings with Marcee, and even join a book club on Goodreads. The Knockoff by Lucy Sykes and Jo Piazza or "I'm 42 and a Dinosaur"